Win a short break to Alton Towers Resort! 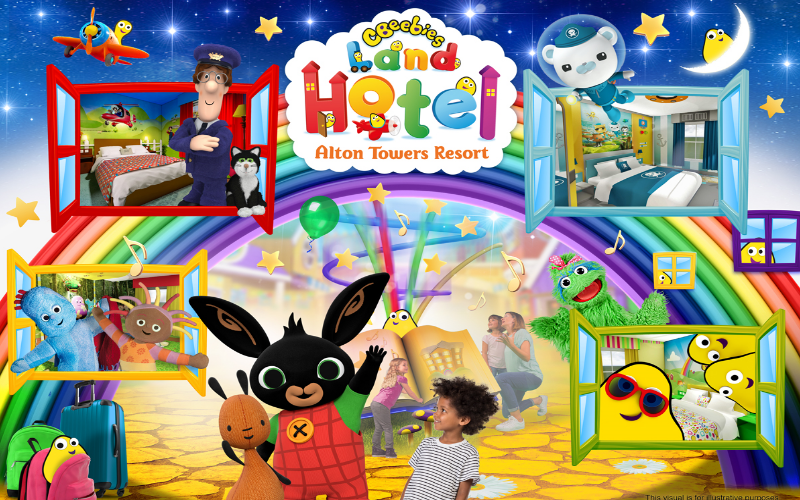 The brand new CBeebies Land Hotel opens on 8th July, and to celebrate, we're giving one lucky reader the chance to win a short break to the Alton Towers Resort, with a stay in Alton Towers Hotel or Enchanted Village, and entry to the Theme Park and Waterpark! Step inside the colourful world of CBeebies Land Hotel. All uniquely designed for young families, it's bursting with music, stories and adventures for little ones to enjoy. Home to unrivalled family entertainment featuring meet and greets with some of your favourite CBeebies characters, live shows, story time and CBeebies games to play, the fun is endless! Featuring interactive games and play items, each themed room is uniquely designed to give little ones a sleepover like no other. The Hotel is a stone’s throw from Alton Towers Theme Park, meaning the fun never stops. Plus, CBeebies Land - located at the heart of the Theme Park - is bigger than ever this year, with the arrival of two brand new experiences: Go Jetters Vroomster Zoom Ride, allowing children to pilot their very own vroomster, and The Furchester Hotel Live Show. There's plenty for thrillseekers young and old to enjoy, too, with the daunting Big Six Challenge taking place over the entire summer. Riders can prove they're STRONG enough, by tackling the formidable line-up of The Smiler, Th13teen, Rita, Oblivion, Nemesis and Galactica. Successful competitors will be rewarded with a free return Theme Park visit in September, and entered into a prize draw to win even more amazing prizes. Alongside the brand new CBeebies Land Hotel, Alton Towers Resort is home to the nation's quirkiest accommodation with the steampunk eccentricity of Alton Towers Hotel, the Caribbean vibes of Splash Landings Hotel, and the tranquil woodland of Enchanted Village. A tropical indoor Waterpark, terrifying high ropes course, Extraordinary Golf, and luxury Spa mean the fun never stops at Alton Towers Resort - there truly is something for everyone to enjoy, whether you're coming for a day or making it a stay.